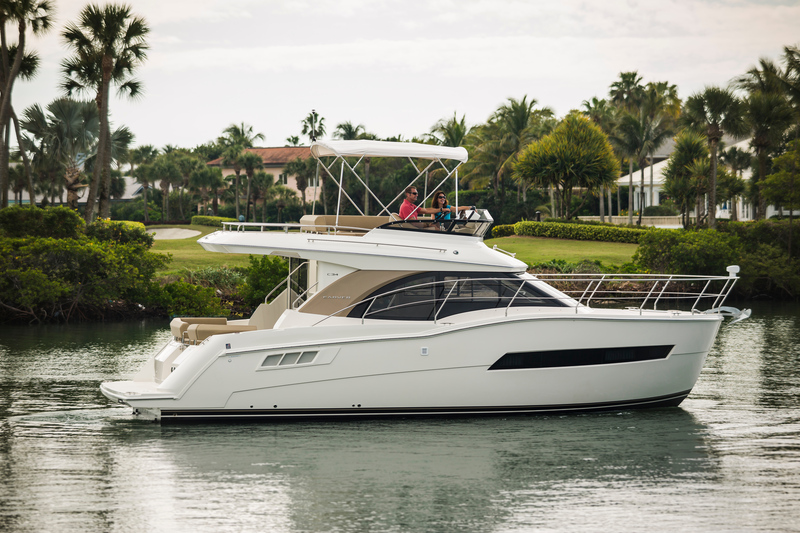 The C36 Command Bridge offers a fresh take on the flybridge cruising sedan by proving that at 36ft you can still have all the amenities of a larger yacht without making compromises. Carver is the perfect manufacturer to produce this with its reputation for maximizing every inch of space providing the most possible utility for the owner. 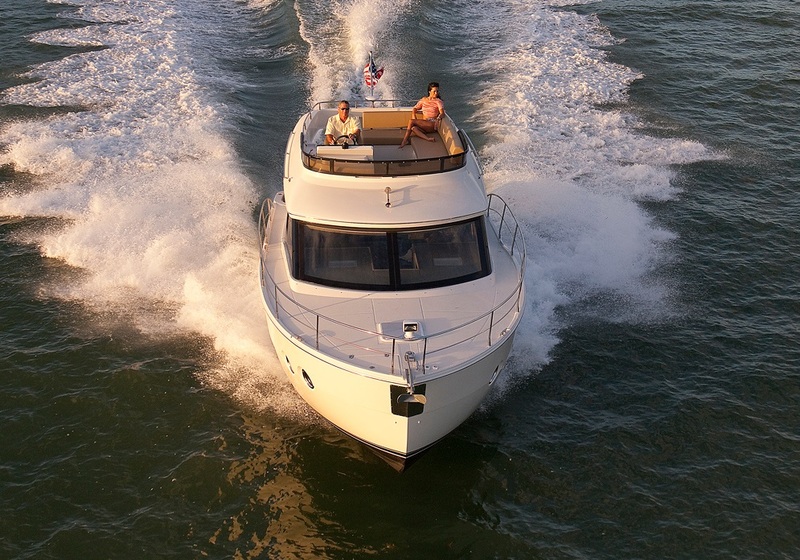 She is easily manageable, economical cruising, and comfortable all while maintaining the striking styling of the new Carver lineup. Calling the C36 a “Command Bridge” on a fly bridge cruiser of this size was no accident! It’s instantly legitimized when you take the helm of this impressive yacht and take your first look out over stunning bow. From this vantage point you and your guests will enjoy panoramic, 360-degree views of your surroundings. The helm area provides ample space for today’s latest navigation equipment and system controls. The helm seat location allows you to operate the C36 while being right in the middle of the conversation. You will especially appreciate the 360-degree visibility when approaching the dock on the C36, which has a clear line of sight to the rear of the swim platform that’s easily visible through the stairway opening. To further the ease of docking, bow and stern thrusters are available features that can make anyone look like a seasoned pro. When Carver’s designers carried the C36 13’ beam forward, it resulted in an abundant amount of space in the lower deck that is very unexpected in a cruiser of this size. This is obviously displayed in the large master stateroom with its elevated island queen size bed, 6’5” headroom all the way forward, two hanging closets, four overhead cabinets, and lots of natural light provided through the large windows and overhead hatch. 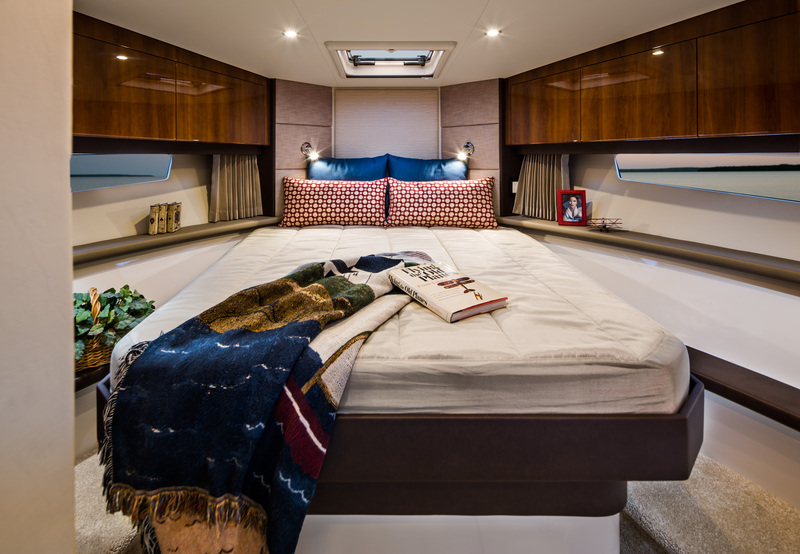 The guest stateroom on the C36 can be configured either as two twin beds, or by installing the filler cushion it converts to a full queen bed. 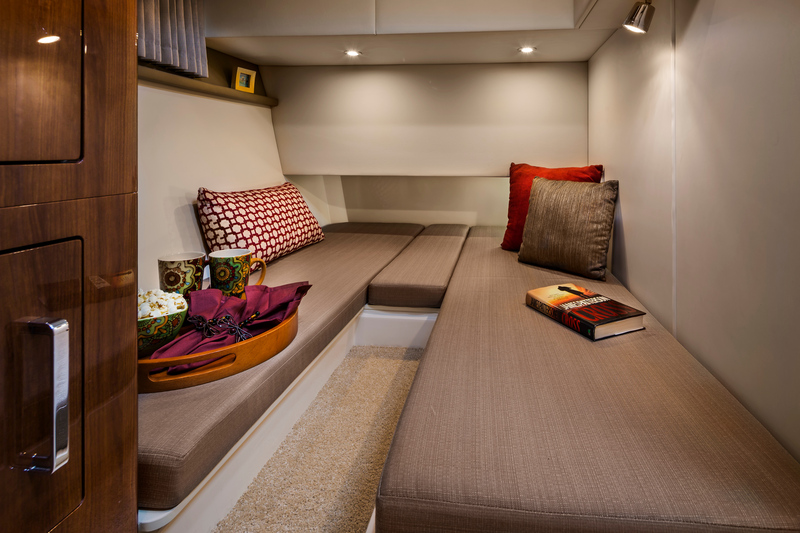 A large hanging closet and storage cabinet offers ample space for their gear and additional storage under the bunks. An overhead etched glass skylight and large side window add natural light, contributing to the open feeling of the space. 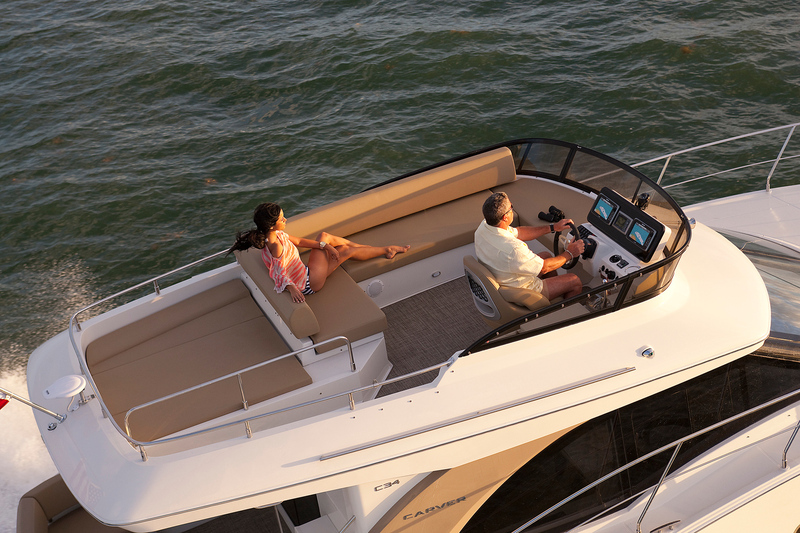 Adding a flat screen TV and a separate stereo system will provide your guest with all the comforts of home while aboard. 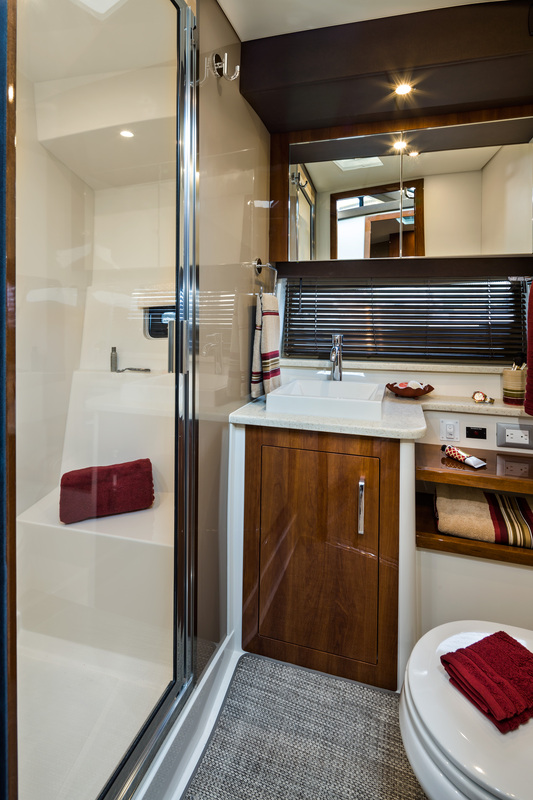 The C36 head boasts a stall shower, beautiful sink, plenty of storage room, and high-quality fixtures with plenty of lighting. The C36 Command Bridge is designed to respond to what boaters want in today’s yachts. Carver listened and addressed the needs of smaller express cruiser owners looking to up their overall length, cruising comfort, and increased range. The axe bow design of the C36 keeps more hull in the water forward, smoothing out the ride in heavy seas. As we have seen while examining the C36’s spacious layout it also increases the interior volume of the yacht considerably. The C36 blends styling that is sure to turn heads on the water with her impressive luxury, comfort, and practical performance, all demanded by today’s discerning yacht owners.